The South West of Ireland has a temperate climate and as such is blessed with a vast array of wildflowers, shrubs and trees that can only survive in moderate conditions. The phenomenon that contributes to the weather in South Kerry and West Cork results from the Gulf Stream that transports tropical, warm water from the Gulf of Mexico across the Atlantic to these shores. Bonane Heritage Park lies close to the border between Kerry and Cork and makes for the ideal place to witness some of the many different varieties. The most commonly occurring of these wildflowers and shrubs are detailed below: the common name, followed by the Irish name in brackets and then a brief description. Ireland is a land of myth, folklore and legend and as such most of the flowers have a story attached to them, some of which are detailed together with references from famous literary icons such as Shakespeare, Wordsworth, Tennyson and Seamus Heaney. 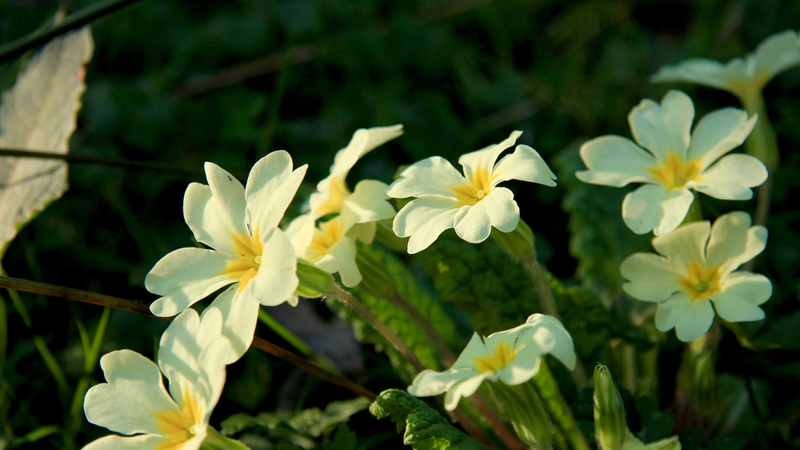 So, if you think all yellow flowers are either dandelions or buttercups – think again. Did you notice the water forget-me-nots near the entrance to the park? As you walk around, take a few minutes to see what other flowers you can find and let us know if you come across any not mentioned here. There is such a proliferation of wildflowers to be found at Bonane Heritage Park the list would seem endless, so below are an example of just a few. At the bottom of the page there is a link to a PDF document that details many other varieties; why not print it out and when you come to Bonane Heritage Park, County Kerry make a point of trying to spot some of them. 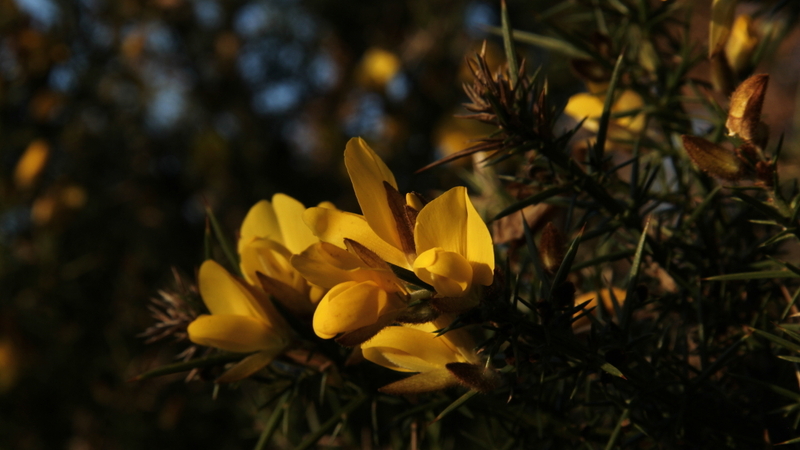 Furze (also known as Gorse or Whin) is probably the most readily identifiable shrub that graces Ireland’s landscape and it’s best descibed as evergreen, spiky and colourful. It grows in thick, dense clumps and shows off it’s bright yellow peaflowers for approximately 9 months of the year. If you’re brave enough to get close to it, some of the varieties smell like coconut. There is much written about furze but the most well known phrase must be “when gorse is out of blossom, kissing’s out of fashion”. Perish the thought! Folklore: in County Kerry it is said that if you ‘get a few handfuls of the yellow blossoms of the furze and boil them in water and give the water as a dose to a horse, this will cure worms’ (from the National Folklore Collection, University College Dublin). Tall, graceful, downy, biennial plant of woodlands, moors, mountains and sea cliffs, the Foxglove thrives on acid soil and quickly colonises recently cleared ground. Reaching 1.5m, it can have up to 75 blooms on one stem. Its 4-5cm flowers are pinky-purple but can also be white. The latin name for Foxglove is Digitalis which literally translates to ‘finger-like’ so it’s not hard to see how it came by some of its many popular nicknames such as fairy fingers and fairy gloves. The foxglove is a very common sight in Kerry and indeed throughout Ireland, so much so that there are place names that reflect their abundance; for example in County Clare there is a town called Gort na Méaracán (Gortnamearacaun) which translates to ‘field of the foxglove’. Folklore: in Ireland there is a folk tale that it is bad luck to bring foxglove into the house on May Day. Uses: although poisonous, this plant was widley used for the treatment of heart conditions and in Ireland it was used a remedy for skin problems such as boils and ulcers. It is known as the King of Herbs. Folklore: Avoid eating blackberries (or indeed other wild fruit) after the festival of Samhain (meaning summer’s end) because a malevolent fairy called Púca spits on them and renders them inedible. Uses: the berries make wonderful jams and tarts and can be used as a dye, whilst the long shoots were used for wickerwork and thatching. Folklore: bog cotton, as it is more commonly known in Ireland, is said to have been cursed by St. Patrick. Uses: once used as a filling for pillows and mattresses, making candlewicks and even as a dressing for wounds. Common knapweed can be mistaken for thistle but if you’re unsire, the knapweed is void of the prickles! It flowers from June all the way through to October and is a member of the daisy/dandelion/thistle family; one of the largest groups of Irish wildflowers and in County Kerry Knapweed is sometimes known as ‘Buttonweed’. It has a high value to the natural world as it attracts honeybees, bees, butterflies, hoverflies, birds and several species of insect. Like many other wildflowers, the knapweed makes an appearance in poetry and is referred to in the Mouse’s Nest by John Clare. Folklore: knapweed was used in years gone by to foretell a maiden’s future! Uses: knapweed was once used as an ointment to heal wounds. It was also used to soothe sore throats and bleeding gums and with pepper for loss of appetite. It is also said to be a successful treatment for catarrh. The Red Clover is a remarkably versatile wildflower and of course is the flower that follows the leaves of the Shamrock – the emblem of Ireland. Did you know that you can tell from the leaves of the Shamrock whether the flower will blossom red or white? The leaves of the red clover have a white ‘V’ shaped mark, called a chevron, in the centre (see picture to the left). Folklore: Porbably the most well known is that a four leaved clover brings good luck and good health. In County Kerry it was lore that when boiled, ‘the water is good for washing a sore. There is great healing power in it’. (From the National Folklore Collection, University College Dublin. NFC 782:350). If researching red clover, it can be seen that it is indeed a hugely important herb with potential for all sorts of medicinal uses – so there is truth in the old tale that it has ‘great healing power’. Uses: red clover ointments have been applied to the skin to treat psoriasis, eczema, and other rashes and also has a history of use as a cough remedy – particularly so in County Kerry. Bell Heather, like St. Patrick’s Cabbage (below) is part of the Lusitanian Flora – a group of wildflowers native to Ireland but mainly absent from Britain and are a unique collection of mediterranean plants, originally from the Iberian Peninsula (North Spain and Portugal). In Ireland most are found in the South and West. Bell heather is an evergreen shrub that produces an abundance of small, bell shaped flowers from June right through to the end of September. Like so many other native Irish wildlflowers, the heather has captured the imagination of many a poet; click here to read ‘Among the Heather’ by Irish born William Allingham. Folklore: In County Kerry there was a saying ‘gold under furze, silver under rushes and famine under heather’ as heather is usually associated with poor quality soil but perhaps a more uplifting tale is that it was rewarded with a myriad of beautiful flowers from God after selflessly covering the mountain tops with it’s evergreen colour when other shrubs and wildflowers would not. Uses: heather has been known for a whole host of different things ranging from being added to beer, being used as fodder for cattle, a dye, making brooms and even curing coughs and asthma. Bracken is the general term that describes over 1200 different varieties and in spring assists in turning the mountain tops from brown to a lively green. It is a hugely successful plant in that it survives in every type of environment except the desert and can be found on every continent except Antarctica! Evidence of its existence has been found fromover 50 million years ago. Although it can sometimes be seen as a nuisance for the fact that it is able to colonize areas so quickly, it is in fact very valuable to the natural world by providing shelter to a number of plant species and fungi, several different varieties of bird, moths and butterflies to name but a few. Folklore: In Ireland it was widely believed that gathering fern seed on St. John’s Eve would make the person carrying it, invisible. Uses: it has been used across the world as animal bedding and also winter mulch on gardens. Folklore: the forget-me-not has long been associated with love and friendship and it is said that the name was given to the flower after tragedy struck when a knight courting his love fell into a river and shouted “vergiz mein nicht!” as he threw to her a bunch of flowers. Vergiz mein nicht translates to “forget me not!”. Uses: the forget-me-not has few herbal applications, but it was believed that it could be made into a syrup and administered for pulmonary conditions. A familiar little wildflower of the woodlands and grassy places, this plant is quite similar to Early Dog-violet and is easily confused. The unscented, blue-violet flower is always solitary on the stem and the mouth of the flower has a pattern of deep purple lines which run into the centre over a paler violet patch, becoming white and the upper petals have a fringe which is over the opening. The dark-green, heart-shaped leaves are on long, slender stalks. This native plant which blooms from April until June is a larval foodplant of the Dark Green Fritillary. Again it is one of those delicate, little flowers that you can easily walk past and yet it grows in abundance in the Heritage Park and all across County Kerry. When you’re out walking anywhere, along lanes, through grassy meadows, have a closer look as it can be overshadowed by other, larger plants and ferns. Shakespeare was a great fan of the violet and references to it appear in at least 18 passages of his works but then his hometown of Stratford-upon-Avon was renowned for it’s magnificent dsiplays of violets in early spring. Folklore; the ‘dog’ violet was given its disparaging name because unlike the other species of violet, it has no smell. The violet is associated with sadness and death but also with beauty and bashfulness. Uses: in Ireland the violet was used as a poultice to cure boils, but they have also been used to make cosmetics. St. Patrick’s Cabbage is part of the Lusitanian Flora and is found during the months of May to August.The stems stand approximately 30cm high with star-shaped white, or sometimes pink, flowers that are red spotted. The leaves are spoon-shaped, with zig-zag edges and somehow the plant manages to find a foothold on rocks, coastal and mountainy ground. The lusitanian flora describes a range of plants that grow here in Ireland and are not found at all in Britain but rather in Continental Europe or North America. There are 16 species of wildflower that belong to this category and are generally found in the South and West of Ireland – many in County Kerry and St. Patrick’s Cabbage belongs to the Atlantic Species. Uses: the leaves are said to be a cure for warts. Sheep’s Bit is a pretty little plant which grows in rocky places, cliffs and heaths showing off its bright blue rounded flowers which brightens up the area from May through to September. It is easily confused with Devil’s Bit. Milkwort can be hard to spot so a careful eye is required. The best place to see the Milkwort is either near the path on the way up to the Bullaun Stone or around the edges of the Ringfort. The flowers can be seen between May and September but, perhaps becasue of the fine, dry weather, it was flowering well into October this year (2010). The Milkwort seen in the Heritage Park has blue flowers but can also be mauve, pink or white in colour. Folklore: The milkwort has also been called ‘Fairy Soap’ as it was believed that the fairies made a lather from the root and the leaves. Uses: Once believed to be a cure for warts and also as a tonic to nursing mothers to increase the flow of milk.